Every smoker voluntarily destroys himself for the own money, paradoxically. Human health has a negative impact a huge number of factors, one of which is smoking. According to statistics, smoking person smokes one pack of cigarettes per day on the average. The average cost of a pack of cigarettes is $6. The average monthly budget of smoker is $180. 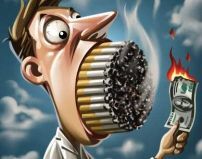 The people spend money on their own destruction, as it`s no secret that smoking destroys our immune system, because it reduces the amount of vitamin C in the human body. In the event of a disease due to smoking, smoker takes the money from his family for treatment, instead of having to work and bring money into the family. Smoking strongly promotes a staggering number of diseases such as chronic bronchitis, tubercle, cardiovascular system, esophagus, and stomach as well as promotes the emergence and development of cancer. According to various scholars, this habit reduces life expectancy by an average of 15 years. Smoking can be compared to one of the varieties of suicide, as all well-informed about its dangers and continue to actively poison themselves. In addition to the harm to themselves personally, they are harmful to the people around them who are the victims of passive smoking. This happens when you stay with smoker in the same room or premises. In the recent years in USA, the percentage of smokers in the general population decreased, but despite this, it is still relatively high, at around 20%. Horrible is the fact that the percentage of female smokers is almost equal to the percentage of male smokers, which later will have a negative impact on future generations of the country. Let us return to the above figures that the smoker spends $ 180 per month on their destruction for their own money. In this case it is better to start the process of quitting smoking for $ 130 per month ($50 a month savings ), and three months later forever give up this bad habit. Then take natural vitamins French laboratory of Professor Zannini for $ 90 a month to have a savings of $ 90 and feel great, be healthy and live longer than 25-30 years completely well, rather than continuing to smoke.